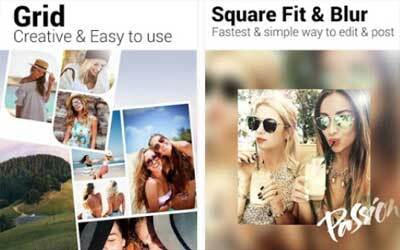 The wonderful Photo Grid APK 5.233 is the best pal of your photo needs. With over 100 millions of fans all over the world, it is a very well-known photo collage creator application for your Android device. If you are tired and bored with your plain and simple photos, you can customize them to your liking and make wonderful and creative photo collages with Photo Grid. Built for maximum comfort, you can finally customize your videos and images in no time. It’s time to decorate the pictures into some unimaginable things in a flash. Photo Grid is a wonderful application, built with plenty of features to satisfy you. The Grid mode allows you to combine and customize multiple photos with cute and wonderful layouts, enabling you to create a whole new photo. The newly-decorated picture of yours will bring colors to the old-and-boring pictures of yours. You can also edit your photos with Photo Editor. Once the tweaking is done, the masterpieces will automatically be saved in a Scrapbook, where you can customize the pictures even more with texts, stickers, and photos. For more fun with the images, you can use Template to add cool and wonderful layouts and templates to the pictures. There are even more fun you can do with Photo Grid. You can build a totally new video, consisting of a collection of many pictures of yours. By using Video Slide, a collection of your photos will turn into a beautiful video story, added with some music, stickers, and texts. For a classic touch of the past, you can also use FilmStrip to make a whole strip of your collection of your photos. There are just so many functions you can use from Photo Grid for Android, and you will quickly fall in love with this simple and practical application. Fix the bug that some stickers downloaded from Store are not displayed when editing.